I live in a small house with a back yard, so I would love to do something with the back yard. I would love to be able to sit outside in the eveneing when it's cooler, reading a book or eating. My house is smaller, like I said, so it frequently gets stuffy. I love cooking, and I think it would be nice to be able to cook and then eat outside in a nice setting in my back yard. I would love to create a walkway with some plants and a nice patio where I can place a table and chairs under a gazebo. 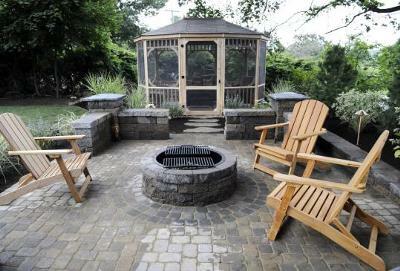 Or, maybe have a small fire pit with benches surrounding it at the end of the walkway. This way, I can still sit outside when it's colder, and make a small fire to take off the chill. I would have to find something to do with the dogs I live with though. I would have to leave their areas alone that they've created so they wouldn't dig up my plants. Then, the general landscaping in my backyard would be awesome.